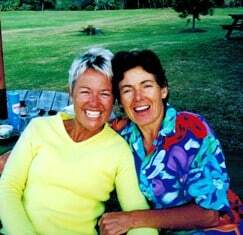 2013 May 10 Womens Adventure NZ - Join us on our next adventure! Since starting this blog not even a week ago, I’ve been amazed at the difference already in my day to day life! When I now wake up in the morning my first thought is, “What am I going to give myself permission to do today?” Just that thought alone is pro-active, positive, life affirming and opens up a whole heap of possibilities!! So much so that I’ve even started a list of all the different things that I’ve thought of that don’t take much time (often only half an hour), mostly don’t cost any money or very little money and don’t require anything more than a bit of enthusiasm! And that’s all it took. Deciding to do it and jolly well doing it! And already my day feels better. Here’s a photo of us about 12 years ago.